Hill writes with a clear intention to teach readers how to embrace a positive outlook against even abysmal circumstances. 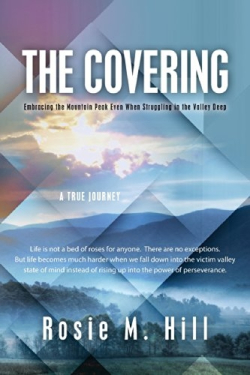 Rosie M. Hill, author of The Covering, personifies perseverance. She writes honestly and objectively about some of the monstrous realities with which she is intimately acquainted: child abuse, poverty, ignorance, racism, and inequality—all of which she overcame. As a young child, Hill struggled to reconcile the actions of adults around her, such as her alcoholic mother and oft-absent father, with the community she discovered in church. She also found refuge in the classroom, guided by a few teachers, including one who took notice of Hill’s bruises and reported her observations to social services, a call that created a nearly irreparable rift between Hill and her family. Hill’s persistent desire to learn drew the sustained criticism from her family that she was “acting ‘white.’” Ironically, it wasn’t until she became pregnant as a teenager, a reality more familiar to her family, that she was accepted. Although she was forced to drop out of school due to the pregnancy, Hill remained steadfast in the pursuit of her education and eventual position in the medical field. How she ultimately succeeds after repeated setbacks is a remarkable story. Hill bolsters her personal chronicle with excerpts from the King James Bible. The biblical verses and motivational epigraphs from authors both familiar and obscure only support Hill’s thesis, though she thankfully does not rely on them to convince the reader of the power of perseverance. Rather, she believably details her own setbacks and successes, marked by teenage pregnancies, failed relationships, educational aspirations, disappointments, and racial and gender-driven inequities in the medical profession. Her story and message are compellingly delivered in a patient and intelligent tone. No matter the obstacles, Hill implores her readers to secure themselves beneath the canopy of faith in order to realize their dreams and destinies.